The Gambia is the smallest country on the continent of Africa, and no matter the size of their villages each one has a chief, known locally as an Alkalo. An Alkalo can be male or female and can be either a descendent of the founder of the village or elected by the villagers. The Alkalo’s rolls include negotiating disputes within the village, giving land and hosting travelers that pass through his domain. One wonders how long the Alkalo system in The Gambia can survive, as the country is rapidly modernizing, and the position is largely unpaid. I co-led, with my wife, the first recorded circumnavigation of The Gambia by foot – a 930 km journey over 42 days. 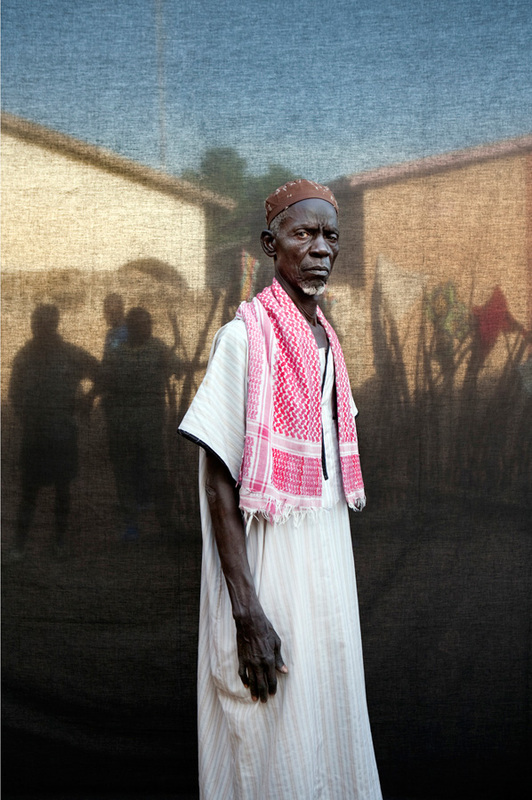 Each night we would spend in a different village and I would make a portrait of the Alkalo and his close entourage. Traditionally a traveler who stays with an Alkalo would present him/her with five bitter seeds called Kola nuts in thanks for hosting and protecting them for the night. This gift giving is called ‘Silafando’ – which translates to – ‘a gift to you on behalf of my journey’. As well as giving the Alkalo the traditional Kola nuts, I would also give him/her a print from the portrait session, made on a battery powered printer. For many this would be the first formal photograph they had of themselves. The portraits therefore are not just a document of the Alkalos and village elders, but are my modern interpretation of the ancient practice of ‘Silafando’.